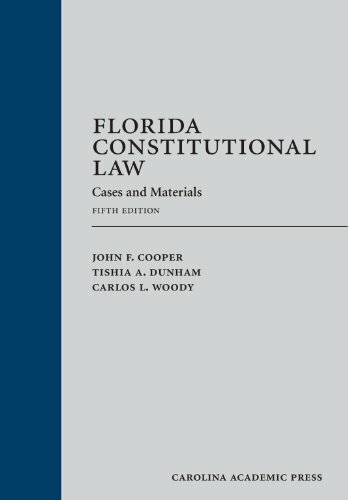 Author(s) John F. Cooper Dunham, Tishia A. Woody, Carlos L.
Florida Constitutional Law, a casebook used in Florida since 1992, is now in its fifth edition. Authors Cooper, Dunham and Woody include the functions of a state constitution and how the Florida constitution is amended. separation of power issues. the major constitutional limits on legislative power. the constitutional jurisdiction of Florida courts, as well as the separation of powers limits on the courts that resemble the Article III limits on federal judicial power. units of local government and their relationship to the state and each other. the major constitutional limitations on taxation and borrowing. a selected review of various provisions of the Declaration of Rights, including Florida's privacy guarantee (which is far more extensive than privacy under the United States Constitution). and Florida's homestead provision. The authors have made this edition more user friendly than the fourth edition.